Pininfarina’s new electric hypercar can accelerate faster than a modern Formula One car. After a long teaser campaign and , famed Italian coachbuilder Pininfarina has lifted the wraps off the at Geneva, the first car to be developed by its new luxury car company Automobili Pininfarina. Named after company founder Battista ‘Pinin’ Farina, the Battista is the most powerful road car ever to ever come out of Italy. Reading the specifications are guaranteed to blow your mind. 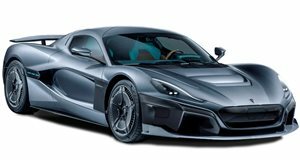 A Rimac-sourced 120 kWh battery pack powers four electric motors on each axle to deliver a combined output of 1,900 hp and 1696 lb-ft of torque. Yes, that’s more power than a Bugatti Chiron. This allows the "world’s first luxury electric hyper performance GT” to rocket from 0-62 mph in under two seconds, making it faster than a modern Formula One car off the line. Accelerating to 186 mph takes less than 12 seconds before the Battista hits a top speed of over 217 mph. Impressively, the Battista still manages to deliver an estimated 280 miles of range when fully charged. Massive carbon-ceramic six-piston brakes measuring 15 inches at the front and rear are housed in 21-inch wheels, providing plenty of stopping power. The Battista’s carbon-fiber body is elegant and curvaceous and is inspired by famous Pininfarina designs from the past such as the Cisitalia 202, Ferrari Dino Berlinetta Speciale, Ferrari Modulo, and Sintesi concept cars. At the front, an LED light strip connects the Battista’s sleek headlights. There’s also a teardrop-shaped cockpit with a long roof, ‘floating’ taillights and an active rear wing that features an air brake function At Geneva, in gray, blue, and white color schemes to showcase the car’s plethora of personalization options. Inside, the driver-focused cockpit has a carbon-fiber steering wheel and a minimalist digital instrument cluster. There are also two larger screens positioned on each side, with the left focused on performance and the right focused on infotainment and navigation. This split continues further below as there are circular displays for the transmission and drive mode selector. Elsewhere, there’s a mix of premium materials including quilted leather, aluminum, and carbon fiber. Production of the Battista will be limited to 150 units when the electric hypercar launches next year, with equal distribution across North America, Europe and Asia / Middle East. That means only 50 examples will be available in the US from "luxury and high-performance vehicle specialists” based in Los Angeles, Miami, New York, San Francisco, Toronto, and Vancouver.